The Statement was adopted at an extraordinary session of the Holy Synod of the Russian Orthodox Church on 14 September 2018 (Journal №. 69). With profound regret and sorrow the Holy Synod the Russian Orthodox Church learned about the statement made by the Holy Synod of the Orthodox Church of Constantinople concerning the appointment of its two “exarchs” to Kiev. This decision was taken without an agreement with the Primate of the Russian Orthodox Church and His Beatitude Metropolitan Onufry of Kiev and All Ukraine – the only canonical head of the Orthodox Church in Ukraine. It constitutes a flagrant violation of the ecclesiastical law and an intervention of one Local Church in the territory of the other. 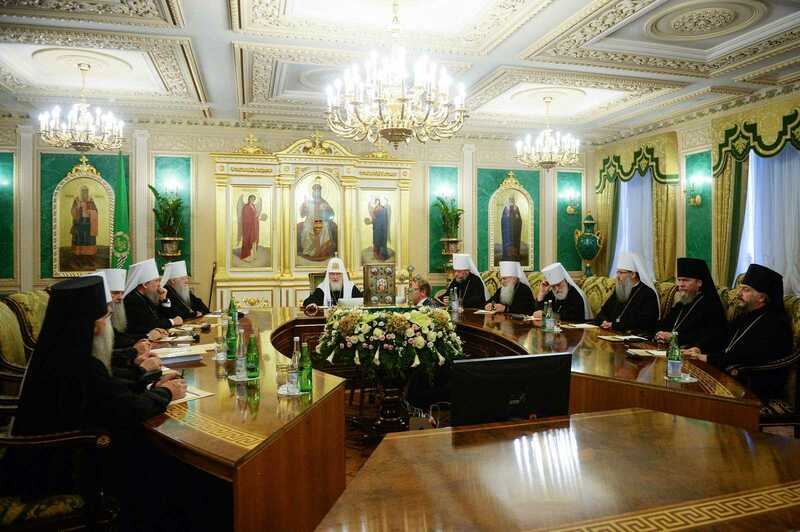 Moreover, the Patriarchate of Constantinople presents the appointment of the “exarchs” as a stage in the implementation of a plan aimed at granting “autocephaly” to Ukraine. This process, according to the statements of the Patriarchate of Constantinople, is irreversible and will be carried through. Trying to justify the claims of the Throne of Constantinople for renewing its jurisdiction over the Kiev Metropolia, the Phanar representatives allege that the Kiev Metropolia has actually never been transferred to the jurisdiction of the Moscow Patriarchate. Such allegations are untrue and completely contradict the historical facts. 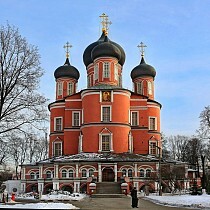 The Russian Orthodox Church and its first see – the Kiev Metropolia – constituted a whole for centuries, despite various political and historical tribulations which at times shattered the unity of the Russian Church. The Patriarchate of Constantinople, that originally had jurisdiction over the Russian Orthodox Church, consistently defended its unity until the middle of the 15th century, as was later reflected in the title of the Metropolitans of Kiev – “of All Russia.” And even after the Primatial see had been transferred from Kiev to Vladimir and then to Moscow, the Metropolitans of All Russia were stilled called Metropolitans of Kiev. The temporary division of one Metropolia of All Russia into two parts was caused by the dire consequences of the Council of Ferrara-Florence and the beginning of the Unia with Rome, which the Church of Constantinople first accepted, and the Russian Church immediately rejected. In 1448 the Council of Bishops of the Russian Church, without the blessing of the Patriarch of Constantinople who was in the Unia at the time, elected St. Jonah as Metropolitan. At that moment the autocephalous life of the Russian Orthodox Church began. However, ten year later, in 1458, the former Patriarch of Constantinople, Gregory Mammas, who was in the Unia and lived in Rome, consecrated an independent metropolitan for Kiev – Gregory the Bulgarian, an Uniate, and submitted to him the territories which are now parts of Ukraine, Poland, Lithuania, Belarus and Russia. The reunification of the Kiev Metropolia with the Russian Church took place in 1686. It was done in a form of the Act signed by Patriarch Dionysius IV of Constantinople and members of his Synod. The document says nothing about the temporary nature of the transfer of the Metropolia, contradicting the current groundless allegations of Constantinople’s hierarchs. No statements concerning the temporary transfer of the Kiev Metropolia can be found in Patriarch Dionysius’ other two Letters of 1686, addressed to the Moscow tsars and the Metropolitan of Kiev. On the contrary, the Letter sent by Patriarch Dionysius to the Moscow tsars in 1686 provides for the submission of all the Metropolitans of Kiev to Patriarch Joachim of Moscow and his successors. “From henceforth and forever more they shall recognize as most senior and first in rank the current Patriarch of Moscow as having received the office of bishop from him,” the Letter reads. The interpretations of the meaning of the abovementioned documents made by representatives of the Church of Constantinople have no justifications in the texts. Regrettably, this is just one of the examples of the intervention of the Patriarchate of Constantinople in the canonical territory of the Russian Church in the 1920s and 1930s. At a time when the Russian Church was subjected to the atheistic persecutions unprecedented in its cruelty, the Patriarchate of Constantinople, behind its back and without its consent, took uncanonical actions against its parts – the autonomous Churches in the territory of the young states formed on the borders of the former Russian Empire: in 1923 it transformed the autonomous Churches in the territory of Estonia and Finland into its own metropolias, in 1924 granted the autocephaly to the Polish Orthodox Church[i], and in 1936 proclaimed its jurisdiction in Latvia. Besides, in 1931 Constantinople included in its jurisdiction the Russian émigré parishes in Western Europe without the consent of the Russian Orthodox Church and transformed them into its own temporary exarchate. It was particularly unseemly of the Patriarchate of Constantinople to engage in attempts to depose the Holy Confessor Tikhon, Patriarch of Moscow and All Russia, canonically elected in 1917. Such attempts were made in the 1920s by the atheistic authorities which artificially created a Renovationist, modernistic schism in the Russian Church with the view of undermining the authority of the Orthodox Church among the faithful, “sovietizing” the Church and gradually destroying it. In the 1920s the Renovationists were active in helping arrest the Orthodox bishops and clergymen, in informing on them and seizing their churches. Patriarch Gregory VII of Constantinople openly supported the Renovationists. His official representative to Moscow, Archimandrite Basilios (Dimopoulo), attended the Renovationist false councils, and in 1924 Patriarch Gregory himself called upon Patriarch Tikhon to abdicate the Patriarchal Throne. In the same year of 1924 the Renovationists published excerpts from the minutes of the sessions of the Holy Synod of the Patriarchate of Constantinople, which they received from Archimandrite Basilios (Dimopoulo). According to an excerpt of 6 May 1924, Patriarch Gregory VII, “at the invitation of the church circles of the Russian population,” took upon himself the task, submitted for his consideration, “of conciliating the distempers and discords of recent times in the brotherly church by establishing a special patriarchal commission for this purpose.” The “church circles of the Russian population,” mentioned in the minutes, represented not the suffering Russian Church subjected at that time to severe persecutions by the theomachist authorities, but the schismatic groups which cooperated with those authorities and actively supported the persecution of the Holy Patriarch Tikhon initiated by those authorities. The reasons why the Church of Constantinople supported the Renovationist schism and took the side of the communist regime in the fight against the Russian Church were openly explained by the abovementioned Archimandrite Basilios (Dimopoulo) in his letter sent on behalf of “all the proletariat of Constantinople” to one of the senior officials of the theomachist regime. “Having defeated all its enemies, overcome all the obstacles and gained strength, the Soviet Russia can now respond to requests of the proletariat of the Middle East who are well-disposed towards it, and thus to win even more of their favor,” the letter reads, “It is up to you… to make the name of the Soviet Russia more popular in the East than it was earlier, and I fervently ask you, as a strong and firm government of a powerful nation, to do a great service to the Patriarchate of Constantinople, especially given that the Ecumenical Patriarch, recognized in the East as the head of all the Orthodox people, has demonstrated by his actions that he is well-disposed towards the Soviet authorities which he has recognized.” In his other letter to the same Soviet official Archimandrite Basilios explained what “service” he meant: it was to give back to the Patriarchate of Constantinople the building that had earlier belonged to Constantinople’s representation in Moscow and annually brought profit to the Patriarchate of Constantinople. Having learned of Constantinople’s decision to send the “patriarchal commission” to the territory of the Russian Church, its only legitimate head, Patriarch Tikhon of All Russia, expressed his resolute protest against the uncanonical actions of his brother. The words that he said a hundred years ago are relevant now as well: “It troubled and surprised us greatly that the representative of the Ecumenical Patriarchate, the head of the Church of Constantinople, without first contacting us as the legitimate representative and the head of the whole Russian Orthodox Church, interferes in the life and internal affairs of the autocephalous Russian Church… Sending any commission without contacting me as the only legitimate and Orthodox First Hierarch of the Russian Orthodox Church, behind my back, is illegal. It will not be tolerated by the Russian Orthodox people and will bring not comfort but even greater distemper and schism into the life of the longsuffering Russian Orthodox Church.” The arrival of the “commission” would have meant not just an interference, but a direct intervention in the affairs of our Church, which is happening now. At the cost of the blood shed by thousands of new martyrs, the Russian Church survived in those years, trying to cover with love this sad page in the history of its relationships with the Church of Constantinople. However, in the 1990s, a period of new ordeals for the Russian Church caused by great geopolitical tempests, the Church of Constantinople once again showed its unbrotherly behavior to the full extent. For instance, despite the fact that in 1978 Patriarch Demetrios of Constantinople made void the Tomos of 1923 concerning the transfer of the Estonian Orthodox Church to the jurisdiction of Constantinople, in 1996 the Patriarchate of Constantinople uncanonically spread its jurisdiction over Estonia. For that reason the Moscow Patriarchate was forced to temporarily break off the Eucharistic communion with it. The promise that representatives of the Ukrainian episcopate of the Patriarchate of Constantinople would not get in contact and concelebrate with the schismatics was not fulfilled. The Patriarchate of Constantinople took no steps to develop their canonical awareness and was drawn by them into an anti-canonical process of legitimizing the schism in Ukraine by means of establishing a parallel church structure and by granting the autocephalous status to it. The position on the issue of autocephaly which the Patriarchate of Constantinople is expressing now contradicts completely the concerted position of all the Local Orthodox Churches, worked out as the result of the difficult discussions within the framework of the preparations for the Holy and Great Council and affirmed in the document on Autocephaly and the Means by Which It Is Proclaimed, signed by representatives of all the Local Churches, including the Church of Constantinople. Lying behind Patriarch Bartholomew’s latest unilateral actions and statements are the ecclesiological notions alien to Orthodoxy. Recently, addressing the synaxis of hierarchs of the Patriarchate of Constantinople, Patriarch Bartholomew said that “Orthodoxy cannot exist without the Ecumenical Patriarchate,” that “the Ecumenical Patriarchate is, for Orthodoxy, a leaven ‘which leavens the whole lump’ (cf. Gal. 5.9) of the Church and of history.” It is difficult to see in these assertions something other than an attempt to reform the Orthodox ecclesiology in accordance with the Roman Catholic model. The Russian Orthodox Church was particularly grieved to learn about the recent decision of the Holy Synod of the Church of Constantinople to allow a second marriage for clerics. This decision constitutes a violation of the sacred canons (Canon 17 of the Holy Apostles, Canon 3 of the Council in Trullo, Canon 1 of the Council of Neocaesarea, Canon 12 of St. Basil the Great), as well as tramples on the pan-Orthodox accord and, in fact, rejects the results of the Council held in Crete in 2016, the recognition of which the Patriarchate of Constantinople actively tries to gain from the rest of the Local Churches. The Patriarchate of Constantinople, in its attempts to assert authoritative powers in the Orthodox Church, which it has never had, is now interfering in the church life in Ukraine. In their statements the hierarchs of the Church of Constantinople go so far as to call Metropolitan Onufry of Kiev and All Ukraine “uncanonical,” based on the fact that he does not commemorate the Patriarch of Constantinople. Meanwhile, earlier, during the Synaxis of the Local Orthodox Churches in Chambésy in January 2016, Patriarch Bartholomew publicly called Metropolitan Onufry the only canonical Primate of the Orthodox Church in Ukraine. On the same occasion the Primate of the Church of Constantinople gave a promise that neither during the Council in Crete nor afterwards would he make any attempts to legalize the schism or to grant autocephaly to anybody on a unilateral basis. We have to state with regret that this promise has now been broken. The unilateral, uncanonical actions of the See of Constantinople in the territory of Ukraine, committed while ignoring completely the Ukrainian Orthodox Church, indicate a direct support for the Ukrainian schism. It constitutes a great temptation among the millions-strong flock of the Ukrainian Orthodox Church that the Patriarchate of Constantinople, considering itself to be the Mother Church for the Ukrainian Church, gives to its daughter a stone instead of bread and a serpent instead of a fish (cf. Lk. 11:11). The deep concern of the Russian Orthodox Church over the erroneous and distorted notions of the Church of Constantinople concerning the situation in Ukraine was personally conveyed by Patriarch Kirill of Moscow and All Russia to Patriarch Bartholomew on 31 August 2018. However, as the further developments showed, the voice of the Russian Church was not heard and in a week after the meeting the Patriarchate of Constantinople published the uncanonical decision regarding the appointment of its so-called “exarchs” to Kiev. In this critical situation, when Constantinople has practically refused to resolve the matter by means of dialogue, the Moscow Patriarchate is forced to suspend the liturgical prayerful commemoration of the Patriarch of Constantinople and with profound regret to suspend the concelebration with hierarchs of the Patriarchate of Constantinople, as well as to break off the participation of the Russian Orthodox Church in the Episcopal Assemblies and in the theological dialogues, multilateral commissions and any other structures chaired or co-chaired by representatives of the Patriarchate of Constantinople. In the event that the Patriarchate of Constantinople will continue to carry out its uncanonical activities in the territory of the Ukrainian Orthodox Church, we will be compelled to completely break off the Eucharistic communion with the Patriarchate of Constantinople. All the responsibility for the tragic consequences of this division will lie personally with Patriarch Bartholomew of Constantinople and the hierarchs supporting him. Being aware that the current situation puts in jeopardy the whole world Orthodoxy, we at this hour of hardship ask the Local Autocephalous Churches for support and call upon the Primates of the Churches to fully realize our shared responsibility for the fate of the world Orthodoxy and initiate a fraternal pan-Orthodox discussion on the church situation in Ukraine. We call upon the plenitude of the Russian Orthodox Church to pray ardently for the preservation of the unity of the Holy Orthodoxy. i – Impelled by a sincere desire to support the Orthodoxy, which is in minority and sometimes in rather difficult circumstances, the Moscow Patriarchate, on its turn, in 1948 granted the autocephalous rights to the Orthodox Church in Poland and confirmed the autonomous status of the Orthodox Church in Finland, granted by His Holiness Patriarch Tikhon in 1921, having agreed in 1957 to consign to oblivion all canonical disputes and misunderstandings between the Orthodox Church of Finland and the Russian Orthodox Church, to recognize the Archdiocese of Finland in its current status and to transfer the New Valamo Monastery to its jurisdiction, after which the prayerful and canonical communion was restored.